Bodyweight exercises are incredibly effective for both getting in shape at home or on the road. Since there are no exercise equipment involved in bodyweight training, they are a convenient and cheap way to get fit. Even more convenient, most bodyweight workouts can be modified to meet your exact fitness level. Whether you are a complete beginner or a Navy Seal, you can get an effective workout just by using your bodyweight. It's also an effective training method for many fitness goals such as building your strength, losing fat, and toning up your body. Looking for even more challenges? As you start to improve your fitness, you can expand your workouts by combining several of these bodyweight moves to create a "full-body circuit workout". And for those looking to improve the overall fitness capacity, it's a great type of training. It's because circuit workouts or circuit training provides the benefits of both cardiovascular exercises and resistance training without adding extra minutes to your exercise routines. It's efficient, fast and robust. I discussed the benefits of circuit training workout here in this post: The Beginner's Guide to Circuit Training Workouts. If you're interested in learning more about how to combine different exercises to make a circuit training routines, it's worth a look. This collection of workouts features 35 best bodyweight exercises targeting all body parts. As well as recommendations for reps, sets and exercise selections for your specific fitness goal. It's the only bodyweight exercises collection you need to get fit using just your bodyweight, nothing else. 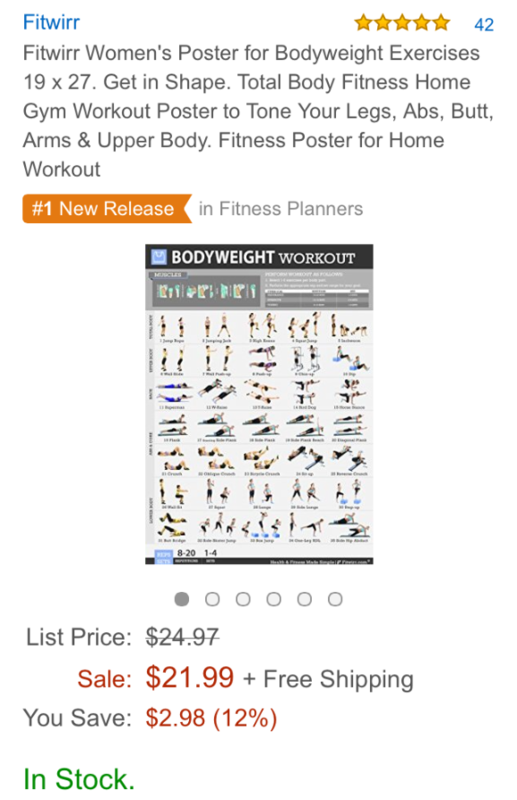 Here's the Amazon link to the complete Bodyweight Workout Poster. Shipping is free. If you love working out with bodyweight—Then you’re going to love this exercise poster. It will help you keep your exercise routine fresh, effective and fun, busting boredom at the gym or your home workout room. This large, 19X27 Bodyweight Workout Poster is available on Amazon with free shipping. Who Is The Exercise Chart for? The Bodyweight Exercise Chart serves as a great guide for people who like to workout at home or gym. It's also perfect for fitness professionals, including fitness trainers, athletic coaches and exercise instructors with their own gym or workout studio. The poster shows you how to perform exercise with correct form, so you can avoid the risk of getting hurt by performing exercises incorrectly. This wokout poster can help you take your training up a notch, even when your personal trainer is not around. With this portable, full-body workout poster features both beginner and advanced bodyweight moves totaling 25 exercises for developing upper body, lower body and core strength. The large exactly 35 poster features a series of clear double images for each exercise, helpful guides for workout variables such as repetitions and sets to keep you progressing and make your workout challenging. Please leave us a comment below. We'd love to hear your feed back on the exercises posters! Do you want to see fitness posters featuring other exercise equipment? Let us know. We'd love to hear about it.